The dairy and cellars are located in the heart of the Brie area. Our cheeses are unique because of their limited geographic area and the know-how of our cheese maker linked with the local lore. This is this specific know-how in production and in affinage that characterizes the regional dimension of our cheese range. Brie de Meaux PDO, Brie de Melun PDO, Brie de Nangis, Coulommiers from Seine et Marne. This line is a marriage of rigor and fancy that draws Brie cheese to original and sometimes unexpected flavors. Fin Briard & Brie with truffles, Grand Marnier, Meaux mustard, pepper, sesame, cumin. The milk is heated for compliance with the regulations required by certain destinations (US, Australia). Thanks to our extensive research we are able to offer products with the same flavor and appearance as our raw milk cheeses. The quality of raw materials, traditional production, ripening in our cellars are the parameters that set these cheeses apart from manufactured pasteurised products. Our milk is collected every day by our own truck from around 20 selected farmers producing milk in PDO area Brie de Meaux and Brie de Melun, in the heart of brie. A well-balanced and healthy feeding : farmer controls the quality and quantity balance of herd’s feeding. On site production of the feed is strongly encouraged and based on a large comsumption of grass and hay (80 to 100 %) completed with cereals. Hygiene and well-being for cattle: outside breeding is favored. In winter, deep liter housing : 9m² area with straw, 6m² area of required exercise. Environment and farm entry : member of agricultural pollutions control program, respect of Agricultural Good practices code. Pré Foret dairy, in Fontenay Trésigny, was opened in 1986. 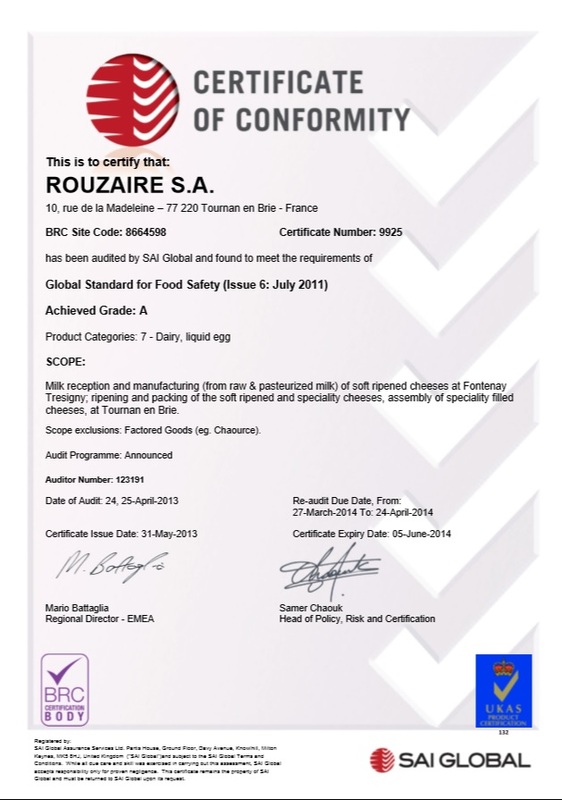 Our production keeps an important regional identity of Brie cheeses. Milk is collected daily and immediately used. Training is fundamental. Their know-how is acquired with experience. The dairy was created with several production rooms to respect temperatures and specific environment to each kind of cheese. We take pride in considering ripening work as an essential aspect of the final cheese quality. The “Affineur” is the taste enhancer. After 4 to 6 days in the drying room, cheeses will be transferred to cellars where they will be ripened for 4 to 6 weeks. They will be hand turned twice a week by qualified people. Our underground cellars have been located in Tournan en Brie since 1960. The surface is 2600m². Rigorous control plans are in place for all stages of processing, from the milk collection to the expiry date. The basis of our food safety control system is a HACCP plan which is comprehensive, thorough, fully implemented and maintained. This plan is integrated in our quality system. Because food safety is a fundamental point for us, our two units are BRC accredited (GRADE A) – (food safety international norm). Our range is free from GMO. 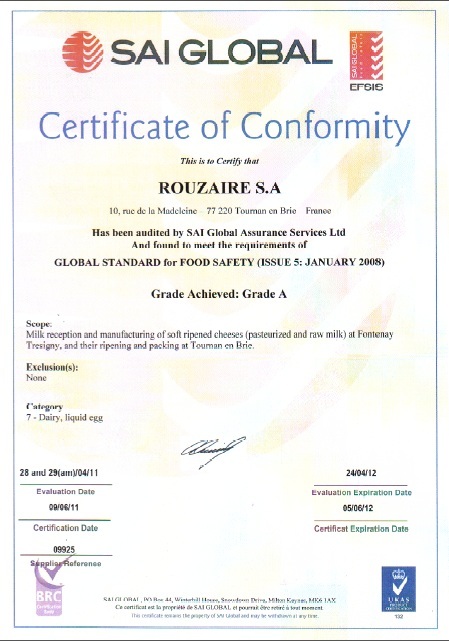 In order to guarantee optimum quality, we assure full traceability from production to customer’s table. The system in place has the ability to trace and follow all raw materials from source through all stages of processing and distribution of the finished product to the customer.